Simple tool to extract embedded bitmaps (JPEG, PNG, GIF) files from a given file. 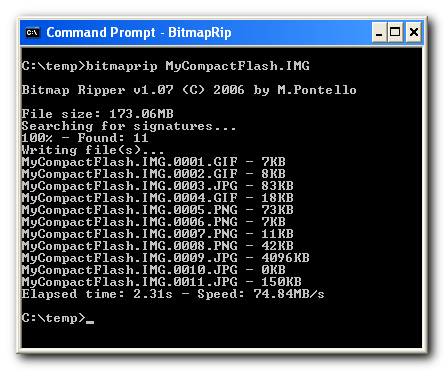 It search for bitmap's headers / signatures, and create a new file for every data block that seems to be a valid image. Could also be used to recover deleted/lost photos or images. BitmapRip is free for personal / non commercial use. If you found BitmapRip useful, you may consider a little donation! + Better JPEG extraction, especially from PDF files. + Ported to FreeBASIC compiler. + First beta version for Linux. + Added support for TIFF files. * Fixed a bug with JPEG files with thumbnails. + Now works on files of any size.